The Disciples of Dirt Mountain Bike Club (DOD) boasts members from all over the Pacific Northwest and beyond, but we focus our efforts within Oregon’s Southern Willamette Valley, where the club was founded and the majority of our membership live and ride. Club members share a high level of passion for mountain biking and the DOD is well known within the cycling world for being stewards of our local trails and champions for improved trail access for cyclists. The 2017/2018 trailwork season was another successful one with DOD volunteers contributing nearly 2,800 hours towards building and maintaining local trails. 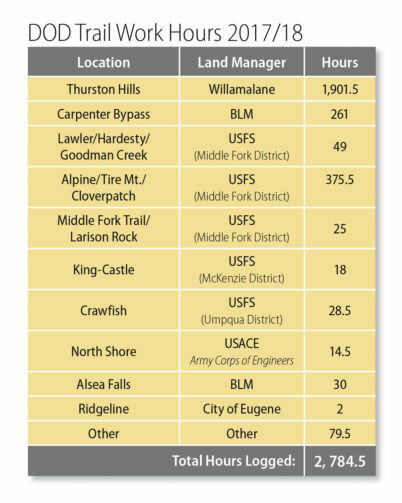 Last year we saw an emphasis on building trails as we partnered with Willamalane on the Thurston Hills trail system where our amazing volunteers logged almost 2,000 hours. We would like to thank our hard working volunteers for giving back to the trails we all love to ride. 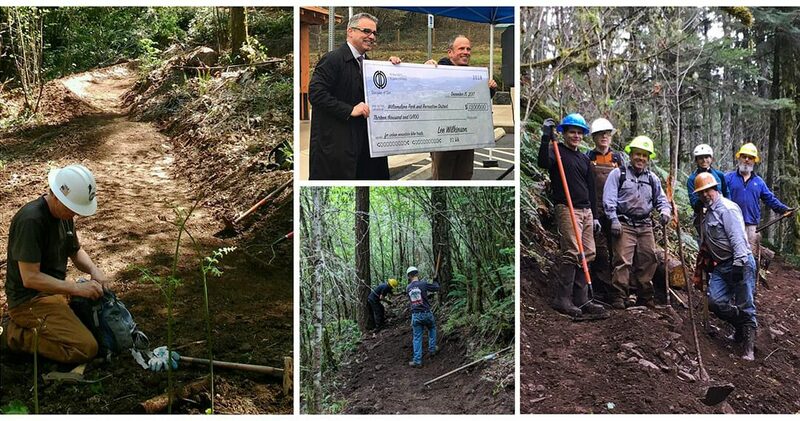 Although most would agree that building and improving trails is its own reward, DOD’s Trailwork Rewards Program recognizes volunteers who contribute at least 25 hours a year. So come on out and join us! Digging in the dirt and meeting new people to ride bikes with is a great way to spend the day. Check the DOD calendar for upcoming work parties. The Disciples of Dirt have had a busy fall, winter and spring working in partnership with the Willamalane Park and Recreation District to develop new mountain bike trails in Thurston Hills. More than one hundred forty volunteers participated in at least one of the many trailwork days that have brought new trail to the edge of Springfield. 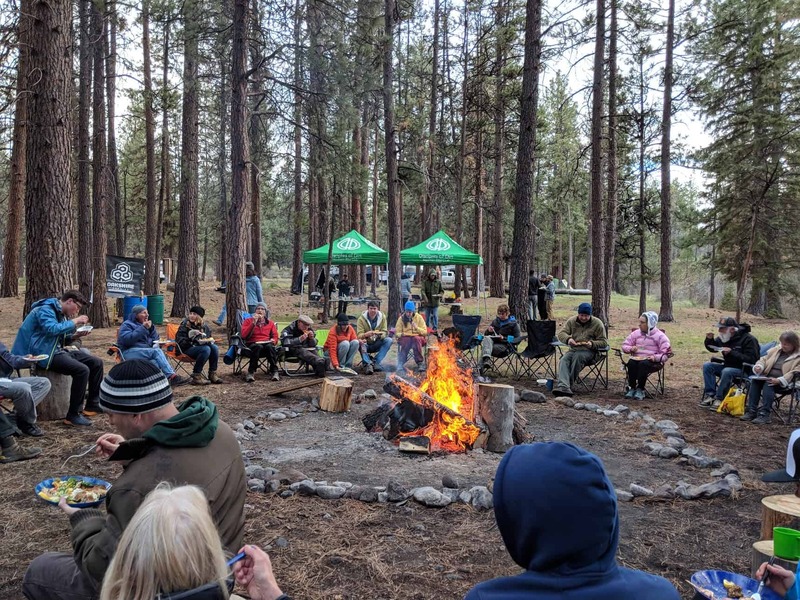 DOD contributed 1,900 volunteer hours to this project and raised $27,000 which includes a whopping $20,000 grant from REI. Willamalane has been a great partner, allowing the Disciples to propose and build trails beyond those originally planned. We are extremely grateful to REI and our other sponsors for their support as well as all businesses and individuals who have contributed funds over the years towards the goal of more local singletrack. As the old saying goes, it takes a village to build a trail! There are tons of great reasons to join the Disciples of Dirt. Whether it’s to help protect and improve local mountain biking trail access, member rewards program or even helping cover our events. How could one argue with that!